ArchOver is a peer to peer business lender that specialises in business loans secured against Accounts Receivables (‘Secured & Insured’) or contracted recurring revenue (‘Secured & Assigned’). 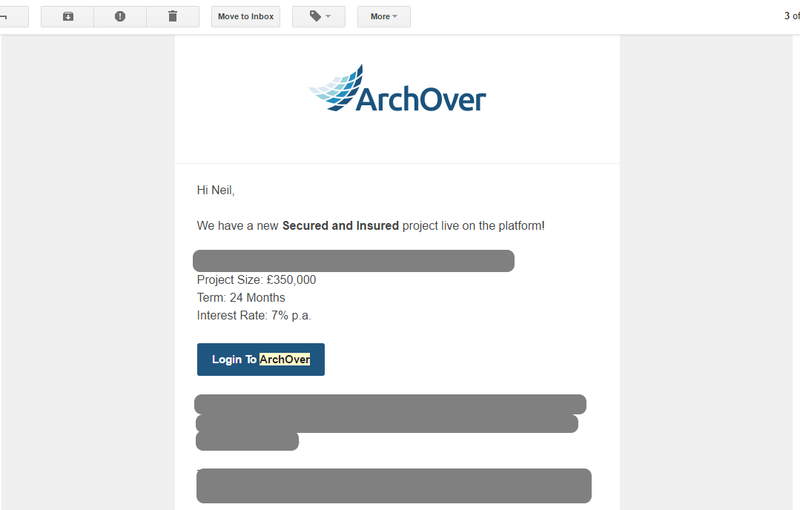 Since ArchOver launched in 2014 they’ve funded nearly £50 million in loans. They state an enviable track record of no Borrower missed payments or reporting defaults, whilst offering interest rates of 6% to 9% p.a. to their Lenders. ArchOver advertise that Borrowers pay interest rates of 8.45%-10.45% per annum, a one-off marketing fee of 4.8% and, for their Secured & Insured lending model credit insurance of 0.147% of turnover: so approximately 11% per annum. Lenders would then receive between 6% and 9% p.a. interest. ArchOver’s credit team performs a detailed credit analysis before a loan is approved. All ArchOver loans are secured against an all asset charge (registered at Companies House) over the Borrower’s business. All Borrower revenues from the sale of goods/services must flow through controlled bank accounts owned by ArchOver before passing to the Borrower. For every loan that reaches their platform, ArchOver monitors the borrower’s management accounts and security each month throughout the loan term. For their ‘Secured & Insured’ loans, ArchOver lends against the Accounts Receivables asset of the SME businesses at a max Loan to Value of 80%. Accounts Receivables (ARs) are the outstanding invoices and work in progress owed to a business by its clients: SMEs typically wait 71 days to be paid by their clients, so ArchOver provides a valuable service to free up this cash earlier. ArchOver insists that the Borrower insures the ARs against non-payment or protracted default. In February 2017, ArchOver launched their ‘Secured & Assigned’ lending model. For ‘Secured & Assigned’ loans, ArchOver lends against the Borrower’s contracted recurring revenue, which is the guaranteed revenue for supply of a service, but does not include the additional services a company might provide on top. ArchOver takes assignment of the contracts as security, in addition to the standard all asset charge and controlled accounts. In May 2017, ArchOver was granted full FCA Authorisation. Receiving full authorisation was a major milestone for the platform which they hope will grow both the Lender and Borrower side of their business. ArchOver are backed by the Hamden Group, who are both investors in ArchOver and invest in some of the lending opportunities. Hamden Group manages insurance assets worth more than £2billion. The Group CEO of Hamden Group, Stephen Harris, is also a Non-Executive chairman of ArchOver. If ArchOver ceases to trade, Hampden are contractually bound to ensure ArchOver remains operational through the term of the loan book run off. Cashback: £75 cashback for new investors who invest £5,000 within 90 days via this referral link. Screenshot from the ArchOver website, all private details greyed out. Each pledge has a minimum of £1,000, and larger investments must be in multiples of £1,000. The interest rates shown are the rates you receive (as opposed to Funding Circle for example who charge 1%). Once you decide to pledge, you are directed to a payment details page. You then have 96 hours to transfer the funds. Alternatively, you can set up Direct Debit on your Profile, and the funds will be collected from your account 5 – 7 working days after you pledged. Only payments under £20,000 can be made by Direct Debit. Interest is paid monthly directly to your bank account, rather than held in a platform account as on most other P2P lending sites. 100% of the capital is returned at the end of the loan term assuming everything goes to plan or unless you have invested in an amortising loan, which appear occasionally. If you invest in an amortising loan you will receive a portion of your capital alongside each monthly interest payment. This information is listed on each ‘Project Description’ under ‘Repayment type’. A Borrower must report their debtor book (Accounts Receivable) on the 5th of the month. We check this against forecasts and ensure that there is a minimum 125% Value to Loan (VLT). The Borrower must also send their full management accounts on the 20th of each month so we can check these against forecasts to keep a close eye on the health of the business. We also do a site visit every six months. ArchOver claim to take a ‘zero tolerance’ approach to late payments from borrowers. This makes a pleasant change from some other platforms which appear to accept any excuse they can, perhaps to avoid a black mark in their statistics or crystalise a claim on the provision fund. There’s no advertised secondary market to sell out of loans early, but you can contact their Lender Portfolio Manager to see what steps could be taken. The Financial Conduct Authority (FCA) stipulates that all P2P lending platforms must have a cooling off period of 14 days for every lending opportunity – this applies to both Lenders and Borrowers. Your 14 day cooling off period starts from the date you make a pledge. This is interesting, because I haven’t seen it offered so openly to lenders on other platforms! Non-UK residents may be allowed to lend, but only at the discretion of ArchOver. If you have a UK bank account and permanent UK address you should be able to open account, subject to the normal KYC (know your customer) and anti-money laundering checks. Your capital is at risk and interest payments are not guaranteed if the borrower defaults. Historic loan default rates are not necessarily indicative of future default rates. Lending over the ArchOver platform is not covered by the Financial Services Compensation Scheme. Note: since first writing the review in March 2017 ArchOver have added a refer a friend offer for new customers who join up via an ArchOver promo code and pledge £5,000 in the first 90 days. You can either join up via the referral link above which automatically fills in the promo code in the relevant space, or manually enter the promo code “MCG1028” in the promo box on sign up. This was added on May 30th 2017. *Referral links also pay me a commission as the referrer. P2P platform reviews are written objectively and any affiliate or referral codes are added later. These go towards building and improving the site. Another excellent article. I was in the process of making an account with them, at the bottom of account creation is a ‘lender referral code’ was wondering if you’d have one of these so you’d benefit from a kickback or anything? I did have a look for the ‘lender referral code’ when I first joined but couldn’t find anything. I can’t see any refer a friend option within my account either. Thanks for the thought, glad that you appreciated the article! No problem. I had a quick Google for a referral code but didn’t find anything. Perhaps it’s there for future promotional use. ArchOver have drawn down my 5k but no sign of Cashback . In my profile screen referral code is blank. I was expecting to see yours. Any ideas or should I just type your in do you think? If you email [email protected] with these details they will probably be able to fix it. If that doesn’t work send me an email at [email protected] with your details, I can also follow up with them what has happened to make sure you get the cashback!